The lesbian, gay, bisexual, transgender and queer political hopefuls include four candidates for governor and 21 for Congress. The midterm elections are less than a month away, and a record number of LGBTQ political candidates will be on the ballot on Nov. 6. With the lion’s share of them running as Democrats, how they fare will serve as a litmus test for where the country stands after two years of a Trump presidency — and several of their races are integral to Democratic hopes of winning control of Congress. More than 430 openly lesbian, gay, bisexual, transgender and queer candidates ran for office across the U.S. this year, and at least 244 of them won their primary races, according to the Victory Institute, a group that works to increase the number of LGBTQ people in public office. According to research by the Victory Institute, 21 openly LGBTQ candidates won Democratic primaries for the House and Senate — a 24 percent increase compared to 2016, and a 320 percent increase compared to 2010 — and a record four LGBTQ candidates for governor won their primaries. “LGBTQ candidates join women, people of color, immigrants and Muslims who are running this cycle to lead the change we demand to see in our politics,” Parker added. Of the 25 LGBTQ people who will be on the ballot next month in congressional and gubernatorial races, not one is running as a Republican. This is the first time since 2010 that the GOP has not fielded any openly LGBTQ congressional or gubernatorial candidates in a general election, according to the Victory Institute. Despite still being a small minority of Democratic candidates, LGBTQ political hopefuls are running in hotly contested districts, and their victories could push Democrats over the line for control of Congress. Republicans currently have a 51-49 majority in the Senate. Two openly LGBTQ candidates for senator — one an incumbent — will be on the ballot next month, and their races are tight. File Photo: Sen. Tammy Baldwin, D-Wis., speaks during a news conference in the Capitol on Democratic on gun control measures, June 16, 2016. Tom Williams / CQ-Roll Call,Inc. One of those candidates is Sen. Tammy Baldwin, a Democrat who is running for re-election in Wisconsin. The first openly LGBTQ person to serve in the Senate, she is currently the only Democrat to hold a statewide office in Wisconsin. Her re-election and those of other incumbent Democrats in “toss up” races in Indiana, Missouri, Minnesota and West Virginia are vital if the Democrats hope to shift the balance in the Senate. Democrats have their eye on flipping Republican Sen. Jeff Flake’s seat in Arizona. Should their nominee, Rep. Kyrsten Sinema, win Flake’s senate seat, she would be the first openly bisexual individual elected to the Senate. Republicans have a 235-193 majority in the House (with seven vacancies due to retirement or death). The Democrats need to hold five contested seats and pick up 23 overall in order to take control of the House, and they hope LGBTQ candidates can help them do so. Chris Pappas is one of those candidates. He is running to represent New Hampshire’s 1st Congressional District, a district Trump won by 2 percentage points. The seat, now held by retiring Democrat Carol Shea-Porter, is one of the 16 Democrats must defend in order to take the House in November. If Pappas does win, he’ll become the first openly gay person to represent New Hampshire in Congress. Democrats are looking to flip a number of districts, including several in red states like Florida, Kansas and Texas. Lauren Baer is the “best chance of an LGBT candidate winning Florida,” according to Terry Fleming, president of the Florida LGBTA Democratic Caucus. He said he’s “optimistic” about flipping the state’s 18th Congressional District, and recent polling puts Baer within a few points of her Republican opponent. Democrats also have reason to be optimistic in Kansas. Last week, the GOP pulled funding for Republican Kevin Yoder, indicating Democrat Sharice Davids could pick up the seat and represent Kansas in Congress. If she wins, she’d be the first openly LGBTQ member of Congress from Kansas and the first female Native American elected to Congress, according to the Victory Institute. Out candidates Angie Craig of Minnesota and Katie Hill of California are also looking strong in their congressional races, according to the Cook Political Report. However, Andrew Reynolds, a political science professor at UNC-Chapel Hill and author of “The Children of Harvey Milk: How LGBTQ Politicians Changed the World,” said that even the most competitive candidates such as Davids, Craig and Hill will struggle in November if the Democrats do not perform well overall. Gina Ortiz Jones is one of 55 LGBTQ candidates who ran for office in Texas this election cycle, though not all of them made it past the primaries. Ortiz Jones, an Air Force veteran, is hoping to unseat Republican Rep. Will Hurd in the general election to represent the state’s 23rd District. “That would be an indicator of a significant change in the needle of politics,” Reynolds said. The four LGBTQ candidates running for governor represent nearly every letter in the acronym. Oregon Gov. Kate Brown, a bisexual Democrat who in 2016 became the first openly LGBTQ person to be elected governor, is in a tight race against Republican Knute Buehler. 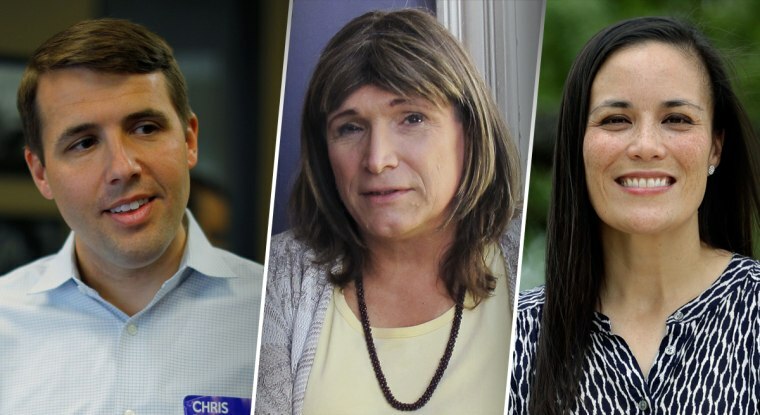 The other gubernatorial candidates include Lupe Valdez, a lesbian Latina running in Texas; Christine Hallquist, a transgender woman running in Vermont; and U.S. Rep. Jared Polis, a gay man running in Colorado. While Polis leads his Republican challenger, Walker Stapleton, in the polls, Valdez trails Republican incumbent Greg Abbott by a wide margin. Vermont’s polls have been mixed — showing everything from a tight race to a landslide victory for the Republican incumbent, Phil Scott. When looking at all statewide elections, however, there is reason to temper optimism about the “rainbow wave,” according to Reynolds. He warned that we may not see enough LGBTQ officials elected on the state level to replace the ones leaving office this year, thus producing a stagnation or even slight decline in the overall numbers. “The whole rainbow wave is a little bit of a false narrative," Reynolds said. "Candidates are running but not always being put in places where they can always win and jump those hurdles." Currently, there are 577 known openly LGBTQ officials across the U.S. — just 0.1 percent of elected officials nationwide, according to the latest report released by the Victory Institute. This figure includes one governor, seven members of Congress and 36 mayors across the U.S.
To achieve proportionate representation, according to the report, America’s estimated 11 million LGBTQ adults (roughly 4.5 percent of the adult population), would need to hold nearly 23,000 more public offices, a 4,000 percent increase. With an estimated 244 openly LGBTQ people expected on the ballot next next month, proportionate representation is far off, but advocates hope this year’s record number of out political candidates is just the beginning of a long-term trend.